International & Local Business Directory Listing. Product & Service Enquiry Improvement. 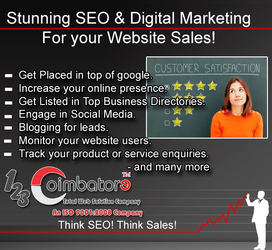 123coimbatore is a leading web development company in coimbatore with ISO 9001:2008 certification for web services serving customers globally. Our motto is to provide best quality services to all our clients for continual improvement. With 1000+ satisfied clients our company has been functioning from 2008 in Coimbatore, India.